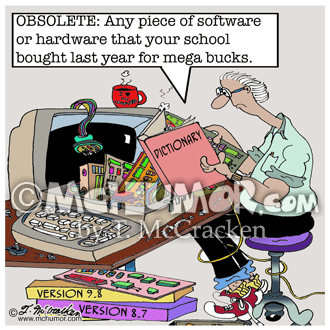 Education Cartoon 7003: A teacher reads the definition of "Obsolete" in a "Computer Dictionary" as "Any piece of software or hardware that your school bought last year for mega bucks." 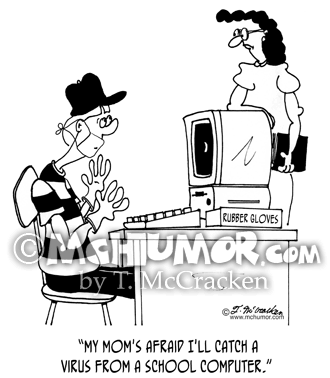 Computer Cartoon 5208: A kid wearing surgeon's gloves and mask says to teacher: "My mom's afraid I'll catch a virus from a school computer." 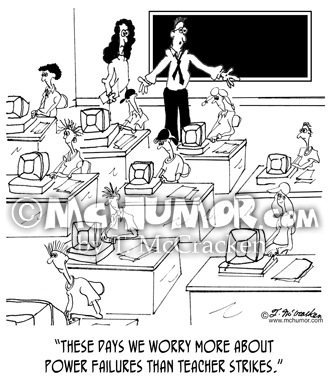 Teacher Cartoon 2869: In a classroom where all the kids are in front of computers a teacher says, "These days we worry more about power failures than teacher strikes." 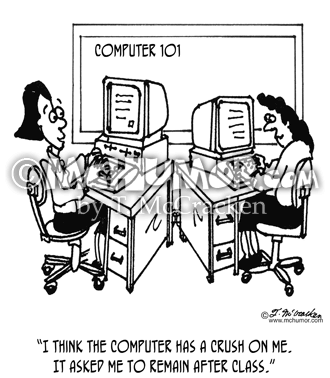 Computer Cartoon 3776: A woman in a Computer 101 class says, "I think the computer has a crush on me. 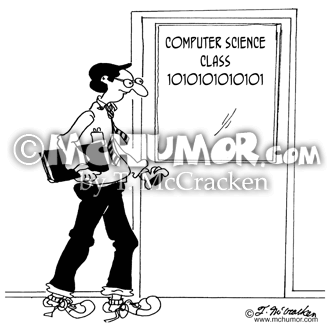 It asked me to remain after class." 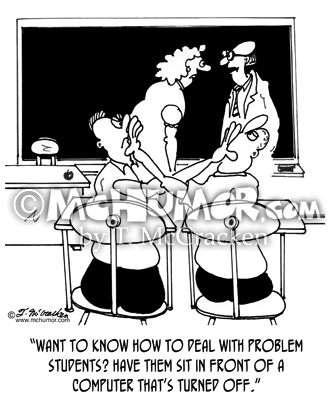 Education Cartoon 5207: As kids fight a teacher tells another, "Want to know how to deal with problem students? Have them sit in front of a computer that's turned off." 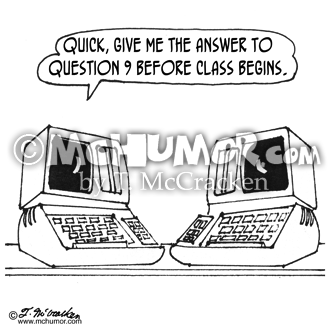 Computer Cartoon 5123: One Computer to another, "Quick, give me the answer to question 9 before class begins." 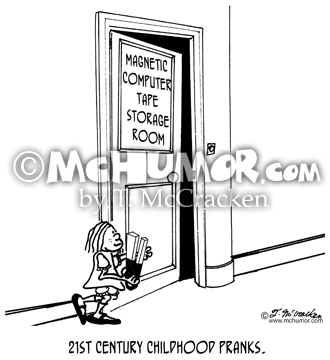 Computer Cartoon 1192: A kid goes into a Magnetic Computer Tape Storage Room with a magnet, "21st Century Childhood Pranks." 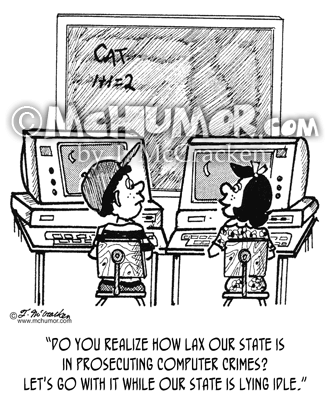 Computer Cartoon 2016: A kid sitting at a computer in school says to another, "Do you realize how lax our state is in prosecuting computer crimes? 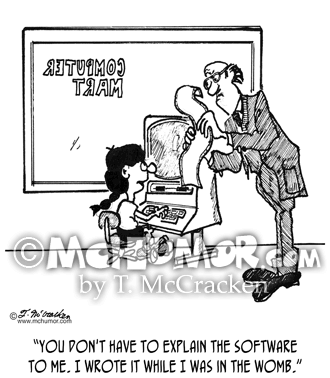 Let's go with it while our state is lying idle."